I'm hopeufullt visiting Perth next month. I'm potentially going to visit on a friday and 2 weekend days. I'm after riding a remaining Renault and 1053 amongst other more common low floor types which I should imagine won't be a problem at weekends. Your responses woukd be greatly appreciated! http://www.perthbus.info Fleetlists is your friend! 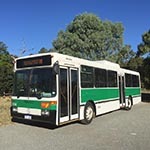 According to this site there are 25 PR180.2s (Renault articulated) in Perth left in service and O405 #1053 in Busselton. If you have time, visit BPSWA, they have 2 Mercedes O305s in preservation, ex-MTT/TP #171 & #339. They also have an O405 ex-TP #1048, preserved privately by a BPSWA member, and Renault PR100.2 ex-TP #647, privately preserved by a member of BPSWA, known on this board as High Floor Bus. 1053 no longer in service - was sighted being repainted at a paint shop in Hazelmere last week. Also, only 16 PR180.2's are left (2 with Swan, 4 with Path and 8 at Transdev). In regards of trying to get a Renault, your best bet is Mandurah Stn, sometime after 3pm, as 6 of Transdev's go off to do school runs, with some possibly doing normal runs after. You won't find them out on weekends. Thanks for the feedback it is much appreciated. Based on this I think I'll just go on the weekend. I have one question though, am I correct on assuming there are plenty of O405NH all Voith, B8RLE, B8RLEA and gas fueled types running at weekends? a350a380 wrote: Thanks for the feedback it is much appreciated. Yes there are a few NHs running around on weekends. For B8RLE action, head to the centre of Perth as all of them (I believe 26 now) are utilised on Perth CATs. For B8RLEA action on a weekend, schedule your visit so that a train line is closed, as on weekends, they are generally utilised on rail replacement. OC500LE gassies are up and running and are undergoing mid-life refurbs a few at a time. Speaking of gassies, if you manage to go on the Perth CATs, try and get on one of the last remaining OC500LE CNG midis before they are refurbed, repainted and cascaded over to Path Transit Malaga. Just bear in mind that as easy as the remaining Renault artics are to find on weekdays, they are generally not used at all on weekends. You'll also find that all of the private preservationists are members of the BPSWA and the private collection now extends to over THIRTY buses. Mercedes-Benz O405NH CNG - On weekdays, try the Fremantle and Morley areas. On weekends, you won't find any around Fremantle, but you can try for some in the Morley area (services in and out of Morley and Mirrabooka bus stations). Mercedes-Benz OC500LE CNG - Marmion area which covers routes to inner north areas such as Glendalough, Stirling, Warwick (routes in the range of 400-447, 990), Southern River area which covers routes around Gosnells, Kelmscott and Armadale (routes in the range of 220-254) and the Fremantle and Rockingham areas covering locations to the west of train stations along the Mandurah Line. Volvo B8RLEA - Can be sporadic on weekends, but try routes 501, 507, 910, 950, 998, 999, or if there are any special events or train replacement on, such as AFL, they will be operating those special routes (numbered in 600 range). On weekdays, you should be able to find them at most major bus stations in peak periods. Volvo B12BLEA - Can also be sporadic on weekends, but try routes 549, 558, 990, or if there are any special events or train replacement on, such as AFL, they will be operating those special routes (numbered in 600 range). On weekdays, you should be able to find them if you hang around Midland or Rockingham or services in the Belmont or Kalamunda area in peak periods. Off The Rails wrote: Also, only 16 PR180.2's are left (2 with Swan, 4 with Path and 8 at Transdev). Well most of the white Renault Articulated buses have retired from the bus fleet but what rego numbers of the PR180.2 buses were still remaining in fleet? The Merc 0405NH gas are not normally used on weekends around Morley/Mirrabooka either. Some OC gas and Volvos. Thanks for all the responses. Much appreciated. I'm going for the weekend so will make the most of what I see. I take it O405nh gas at weekends will be an absolute rarity. The O405nh is what I'm after mainly because elsewhere in Australia they all seem to be zf. Finally, I guess the dennis darts are history now too.